Saint Veronica wrote a lot under the obedience about her mystical experiences. On the April 30, 1700,on the feast of Saint Catherine of Siena Saint Veronica Giuliani received the mystical vision of Jesus Crucified, Saint Catherine of Siena and many other saints. As many other times, under the obedience to her spiritual director, she had to reject all of her visions for fear that those experiences could not have come not from God but from the devil who would come to deceit her. She wrote in her journal: “I trusted myself whole heartedly to God so that he would free me from all kind of deceitfulness that may come from the devil, and also that He may give me a true pain for my sins. Suddenly I got that grace and while I was with this pain for my sins it seemed to me, that I saw coming from the wounds of Jesus five splendorous rays that came towards me, one stopped inside my heart and the others in my hands and feet. I experienced a deadly pain, it seemed to me that a sharp lance penetrated my heart, and my hands and feet with a thick nail. This pain bestowed on me a flame of love toward the divine love and it seemed to me that it was like a magnet that drew myself towards Him. In that moment more communications were given to me and it seemed to me that the Lord wanted that I took that saint ( Saint Catherine) as my teacher and that I should learn from her the zeal that she had for the salvation of the souls, her deep humility and her other virtues; but the last two I would had to learn in a special way. I was in this for long period of time, and those rays were, as I had said before, above me. And it seemed to me that this experience had never happened to me within such a long period of time. While I was with this pain it seemed to me that those saints were praying for me. I greatly desired that they will obtain for me a true knowledge of myself, and also knowledge of all that is in me that is not in accordance with God’s will and that hinder me from the unity with Him in the way that He desires. I also had inside light about some personal defects: my imperious talk, my luck of solicitous charity and humility in all my deeds, and other similar things that I did every day”. Saint Veronica Giuliani Dear Brothers and Sisters, Today I would like to present a mystic who did not live in the Middle Ages. She is St Veronica Giuliani, a Poor Clare Capuchin nun. The reason is that 27 December will be the 350th anniversary of her birth. Città di Castello, the place where she lived the longest and where she died, as well as Mercatello — her birthplace — and the Diocese of Urbino are celebrating this event with joy. Indeed, Veronica was born on 27 December 1660 in Mercatello, in the Metauro Valley to Francesco Giuliani and Benedetta Mancini. She was the last of seven sisters, three of whom were to embrace the monastic life. She was given the name “Orsola” [Ursula]. She was seven years old when her mother died and her father moved to Piacenza as customs superintendent of the Duchy of Parma. 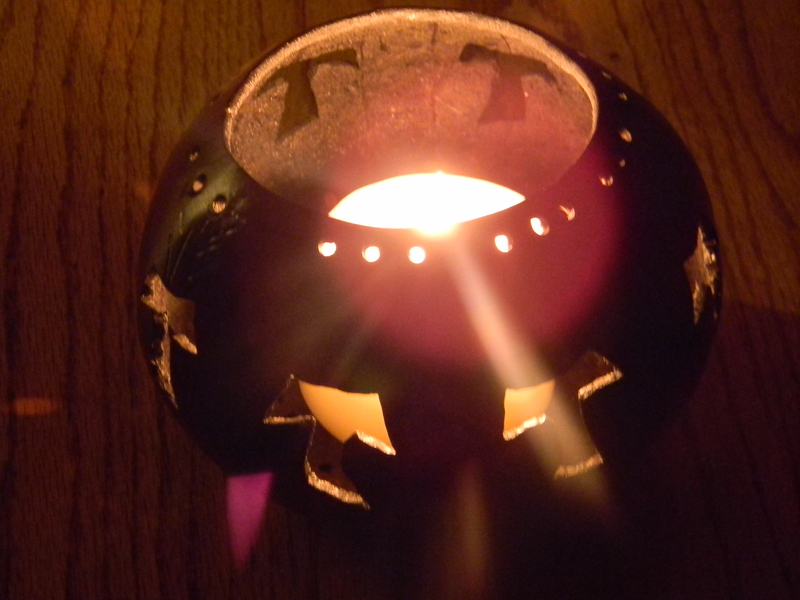 It was in this city that Ursula felt a growing desire to dedicate her life to Christ. The call to her became ever more pressing so that, when she was 17, she entered the strict cloister of the monastery of Capuchin Poor Clares in Città di Castello. She was to remain here for the rest of her life. Here she received the name of “Veronica”, which means “true image” and she was in fact to become a true image of the Crucified Christ. A year later she made her solemn religious profession and the process of configuration to Christ began for her, through much penance, great suffering, and several mystic experiences linked to the Passion of Jesus: being crowned with thorns, the mystical espousal, the wound in her heart and the stigmata. In 1716, when she was 56, she became Abbess of the monastery. She was reconfirmed in this office until her death in 1727, after a very painful prolonged agony that lasted 33 days and culminated in a joy so profound that her last words were: “I have found Love, Love has let himself be seen! This is the cause of my suffering. Tell everyone about it, tell everyone!” (Summarium Beatificationis, 115-120). On 9 July she left her earthly dwelling place for the encounter with God. She was 67 years old; 50 of those years she spent in the monastery of Città di Castello. She was canonized on May 26, 1893, by Pope Gregory XVI. Veronica Giuliani wrote prolifically: letters, autobiographical reports, poems. However, the main source for reconstructing her thought is her Diary, which she began in 1693: about 22,000 handwritten pages that cover a span of 34 years of cloistered life. Her writing flows spontaneously and continuously. There are no crossings-out, corrections or punctuation marks in it, nor was the material divided into chapters or parts according to a plan. Veronica did not intend to compose a literary work; on the contrary, Fr Girolamo Bastianelli, a Filippini religious, in agreement with the diocesan Bishop Antonio Eustachi, obliged her to set down her experiences in writing. St Veronica has a markedly Christological and spousal spirituality: She experienced being loved by Christ, her faithful and sincere Bridegroom, to whom she wished to respond with an ever more involved and passionate love. She interpreted everything in the key of love and this imbued her with deep serenity. She lived everything in union with Christ, for love of him, and with the joy of being able to demonstrate to him all the love of which a creature is capable. The Christ to whom Veronica was profoundly united was the suffering Christ of the Passion, death and Resurrection; it was Jesus in the act of offering himself to the Father in order to save us. Her intense and suffering love for the Church likewise stemmed from this experience, in its dual form of prayer and offering. The Saint lived in this perspective: she prayed, suffered and sought “holy poverty”, as one “dispossessed” and the loss of self (cf. ibid., III, 523), precisely in order to be like Christ who gave the whole of himself. In every page of her writings Veronica commends someone to the Lord, reinforcing her prayers of intercession with the offering of herself in every form of suffering. Her heart dilated to embrace all “the needs of the Holy Church”, living anxiously the desire for the salvation of “the whole world” (ibid., III-IV, passim). Veronica cried: “O sinners… all men and all women, come to Jesus’ heart; come to be cleansed by his most precious blood…. He awaits you with open arms to embrace you” (ibid., II, 16-17). Motivated by ardent love, she gave her sisters in the monastery attention, understanding and forgiveness. She offered her prayers and sacrifices for the Pope, for her Bishop, for priests and for all those in need, including the souls in Purgatory. She summed up her contemplative mission in these words: “We cannot go about the world preaching to convert souls but are bound to pray ceaselessly for all those souls who are offending God… particularly with our sufferings, that is, with a principle of crucified life” (ibid., IV, 877). Our Saint conceived this mission as “being in the midst” of men and God, of sinners and the Crucified Christ. Veronica lived profound participation in the suffering love of Jesus, certain that “to suffer with joy” is the “key to love” (cf. ibid., I, 299.417; III, 330.303.871; IV, 192). She emphasizes that Jesus suffers for humanity’s sins, but also for the suffering that his faithful servants would have to endure down the centuries, in the time of the Church, precisely because of their solid and consistent faith. She wrote: “His Eternal Father made them see and feel the extent of all the suffering that his chosen ones would have to endure, the souls dearest to him, that is, those who would benefit from his Blood and from all his sufferings” (ibid., II, 170). As the Apostle Paul says of himself: “Now I rejoice in my sufferings for your sake, and in my flesh I complete what is lacking in Christ’s afflictions for the sake of his Body, that is, the Church” (Col 1:24). Veronica reached the point of asking Jesus to be crucified with him. “In an instant”, she wrote, “I saw five radiant rays issue from his most holy wounds; and they all shone on my face. And I saw these rays become, as it were, little tongues of fire. In four of them were the nails; and in one was the spear, as of gold, red hot and white hot: and it went straight through my heart, from one side to the other … and the nails pierced my hands and feet. I felt great pain but in this same pain I saw myself, I felt myself totally transformed into God” (Diary, I, 897). 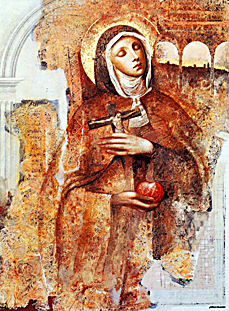 The Saint was convinced that she was already participating in the Kingdom of God, but at the same time she invoked all the Saints of the Blessed Homeland to come to her aid on the earthly journey of her self-giving while she waited for eternal beatitude; this was her undying aspiration throughout her life (cf. ibid., II, 909; V, 246). With regard to the preaching of that time which often focused on “saving one’s soul” in individual terms, Veronica shows a strong “sense of solidarity”, a sense of communion with all her brothers and sisters on their way towards Heaven and she lives, prays and suffers for all. The penultimate, earthly things, although appreciated in the Franciscan sense as gifts of the Creator, were always relative, altogether subordinate to “God’s taste” and under the sign of radical poverty. In the communio sanctorum, she explains the gift of herself to the Church, as the relationship between the pilgrim Church and the heavenly Church. “All the Saints”, she wrote, “are up there thanks to the merit and the Passion of Jesus; but they cooperated with all that the Lord did, so that their life was totally ordered … regulated by these same works (his)” (ibid., III, 203). We find many biblical citations in Veronica’s writings, at times indirectly, but always precise. She shows familiarity with the Sacred Text, by which her spiritual experience was nourished. Furthermore, it should be pointed out that the intense moments of Veronica’s mystical experience are never separate from the salvific events celebrated in the Liturgy, where the proclamation of the Word of God and listening to it has a special place. Hence Sacred Scripture illumines, purifies and confirms Veronica’s experience, rendering it ecclesial. On the other hand, however, her experience itself, anchored in Sacred Scripture with uncommon intensity, guides one to a more profound and “spiritual” reading of the text itself, to enter into its hidden depths. Not only does she express herself with the words of Sacred Scripture but she also really lives by them, they take on life in her. For example, our Saint often quotes the words of the Apostle Paul: “If God is for us, who is against us?” (Rom 8:31; cf. Diary, I, 714; II 116.1021; III, 48). The assimilation of this Pauline text, her great trust and profound joy, becomes a fait accompli within her. “My soul”, she wrote, “was bound to the divine will and I was truly established and fixed for ever in the will of God. It seemed to me that I should never again have to be separated from this will of God and I came to myself with these precise words: nothing will be able to separate me from the will of God, neither anxieties, nor sorrows nor toil nor contempt nor temptation nor creatures nor demons nor darkness, not even death itself, because, in life and in death, I want all, and in all things, the will of God” (Diary, IV, 272). 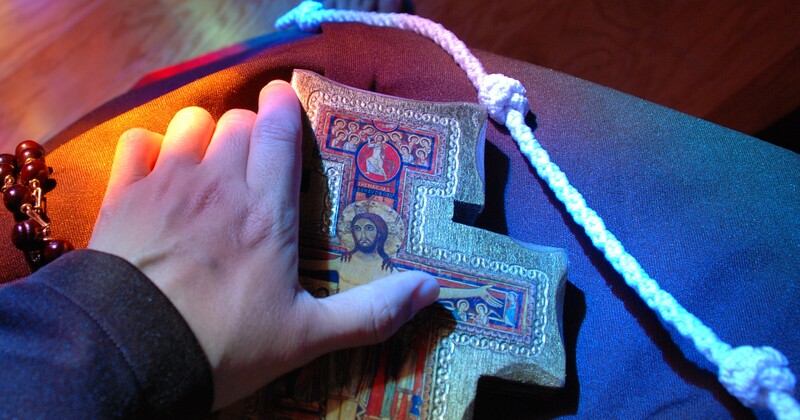 Thus we have the certainty that death is not the last word, we are fixed in God’s will, hence, truly, in eternal life. In particular, Veronica proved a courageous witness of the beauty and power of Divine Love which attracted her, pervaded her and inflamed her. Crucified Love was impressed within her flesh as it was in that of St Francis of Assisi, with Jesus’ stigmata. “‘My Bride’, the Crucified Christ whispers to me, ‘the penance you do for those who suffer my disgrace is dear to me’…. Then detaching one of his arms from the Cross he made a sign to me to draw near to his side… and I found myself in the arms of the Crucified One. What I felt at that point I cannot describe: I should have liked to remain for ever in his most holy side” (ibid., I, 37). This is also an image of her spiritual journey, of her interior life: to be in the embrace of the Crucified One and thus to remain in Christ’s love for others. Veronica also experienced a relationship of profound intimacy with the Virgin Mary, attested by the words she heard Our Lady say one day, which she reports in her Diary: “I made you rest on my breast, you were united with my soul, and from it you were taken as in flight to God” (IV, 901). 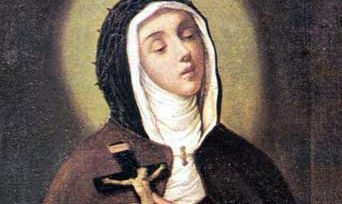 St Veronica Giuliani invites us to develop, in our Christian life, our union with the Lord in living for others, abandoning ourselves to his will with complete and total trust, and the union with the Church, the Bride of Christ. She invites us to participate in the suffering love of Jesus Crucified for the salvation of all sinners; she invites us to fix our gaze on Heaven, the destination of our earthly journey, where we shall live together with so many brothers and sisters the joy of full communion with God; she invites us to nourish ourselves daily with the Word of God, to warm our hearts and give our life direction. The Saint’s last words can be considered the synthesis of her passionate mystical experience: “I have found Love, Love has let himself be seen!”. Thank you… To Special Groups Dear Brothers and Sisters, I extend a warm welcome and prayerful good wishes to the priest alumni of the Pontifical North American College celebrating their fortieth anniversary of priestly ordination. Upon all the English-speaking visitors present at today’s Audience, especially those from Ireland and the United States of America, I cordially invoke God’s abundant blessings. Lastly, I address a special greeting to the young people, the sick and the newlyweds. I hope that you, dear young people, especially you, the young members of Catholic Action, will prepare your hearts to welcome Jesus who comes to save us with the force of his love. May the forthcoming Christmas festivities bring you, dear sick people, who in your experience of illness share the weight of the Cross with Christ, serenity and comfort. I invite you, dear newlyweds, who have recently founded your family, to grow increasingly in that love which Jesus has given us by his Nativity. En 1976, a los 56 años, se convirtió en abadesa del monasterio y fue reconfirmada en este cargo hasta su muerte, sucedida en 1727, tras una dolorosísima agonía de 33 días que culminó en una alegría profunda, tanto que sus últimas palabras fueron: “He encontrado el Amor, ¡el Amor se ha dejado ver! Esta es la causa de mi padecimiento. ¡Decidlo a todas, decidlo a todas!” (Summarium Beatificationis, 115-120). El 9 de julio deja la morada terrena para el encuentro con Dios. Tiene 67 años, cincuenta de los cuales transcurridos en el monasterio de Città di Castello. Fue proclamada Santa el 26 de mayo de 1839 por el Papa Gregorio XVI. Verónica Giuliani escribió mucho: cartas, relatos autobiográficos, poesías. La fuente principal para reconstruir su pensamiento es, con todo, su Diario, iniciado en 1693: son veintidós mil páginas manuscritas, que cubren un arco de treinta y cuatro años de vida claustral. En cada página de sus escritos Verónica encomienda a alguien al Señor, aumentando el valor de sus oraciones de intercesión con el ofrecimiento de sí misma en cada sufrimiento. Su corazón se abre a todas “las necesidades de la Santa Iglesia”, viviendo con ansia el deseo de la salvación de “todo el universo mundo” (ibid., III-IV, passim). Verónica grita: “¡Oh pecadores, oh pecadoras!… todos y todas venid al corazón de Jesús, venid a lavaros en su preciosísima sangre… Él os espera con los brazos abiertos para abrazaros” (ibid., II, 16-17). Animada por una ardiente caridad, da a las hermanas del monasterio atención, comprensión, perdón; ofrece sus oraciones y sus sacrificios por el Papa, su obispo, los sacerdotes y por todas las personas necesitadas, incluidas las almas del purgatorio. Resume su misión contemplativa con estas palabras: “No podemos ir predicando por el mundo para convertir almas, pero estamos obligadas a rezar continuamente por todas esas almas que están ofendiendo a Dios… particularmente con nuestros sufrimientos, es decir, con un principio de vida crucificada” (ibid., IV, 877). Nuestra Santa concibe esta misión como un “estar en medio” entre los hombres y Dios, entre los pecadores y Cristo Crucificado. Veronica was born in Mercatello, Italy. It is said that when her mother Benedetta was dying she called her five daughters to her bedside and entrusted each of them to one of the five wounds of Jesus. Veronica was entrusted to the wound below Christ’s heart. At the age of 17, Veronica joined the Capuchin Poor Clares in Citta di Castello. Her father had wanted her to marry, but she convinced him to allow her to become a nun. In her first years in the monastery, she worked in the kitchen, infirmary and sacristy and also served as portress. At the age of 34, she was made novice mistress, a position she held for 22 years. When she was 37, Veronica received the stigmata. Life was not the same after that. Our Lord chose to make Veronica as much Himself as is possible, and what better way than to share His Passion with her. He had asked her many times what she wished, and she had replied, His Cross. Well on April 5, 1697, Veronica had a vision of Jesus Crucified, accompanied by His Mother Our Lady of Sorrows as she appeared at the foot of the Cross on Golgotha. Veronica’s heart, as with her Savior before her, was pierced. She experienced the crowning of thorns, the scourging, the crucifixion, her own death and that of Our Lord Jesus Christ. Veronica received the stigmata. Now it was time for her to take up the Cross!